Bleakly grey autumn days but bird life goes on quietly in its own way. In a tree top at a field verge a thrush-sized grey shrike in its autumn-day-coloured plumage keeps watch. If you move closer the bird flies with its characteristic up and down meandering flight to a power wire or fence post, keeping a suitably safe distance to the observer. The birds have nested in unpopulated bogs here and in the North, and migration still goes on. For winter up to a thousand birds may stay including the vagrants from the north. With its ash grey back plumage and white underparts the grey shrike is not particularly noticeable – useful for a bird of prey. 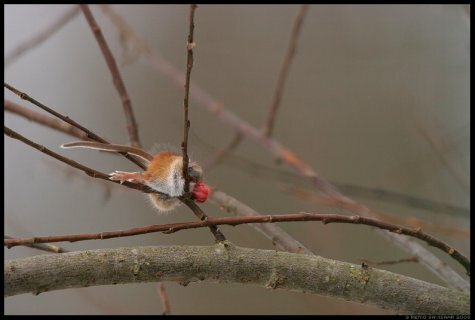 The tail is long, with white feathers at the sides. The top of the head has the same colour as the body and the only thing noticeable from far is the black “bandit’s mask“. The tip of the little raptor’s beak is hooked; it hunts in open landscapes, often hovering, and the prey is carried in the talons. Prey animals are small rodents and passerines. 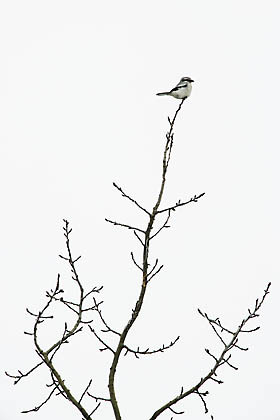 If you happen to see prey hung between branches or even thorns, very probably it is a grey shrike’s food stock. See Remo Savisaar’s photo evidence.